One of my favorite genres of games is the classic push your luck games. I have played Can’t Stop hundreds of times, and I just love rolling the dice just one more time…even No Thanks! has a push your luck element that I can’t resist. I have been on the look out for a good push your luck game to add to our game nights, one that would add a little more ‘game’, a little more theme to the mechanic. One of the Krewe de Gumbo members, Dustin, brought this game to our game group on the advice of Tom Vasel, and Tom was spot on with this one. At Gen Con 2016, we saw this game being played all over the convention, and we ended up picking up five more copies to bring back to our respective game groups and families! Are your game nights getting a little bland? Is your game group ready for the next step in push your luck games? Then, Spice it up! with Celestia. Celestia is a 2015 release from Quick Simple Fun Games designed by Aaron Weissblum. The game play is simple: players take turns as captain of an airship floating from island to island. The object is to score more points (treasure cards in this case) than the other players by advancing the ship. 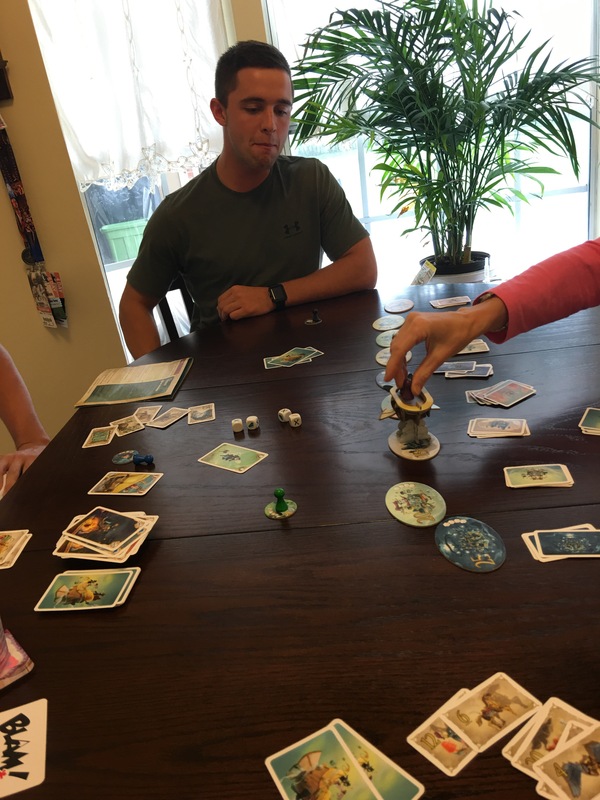 Captains advance the ship by rolling 2, 3 or 4 dice (depending upon the island), and then match cards in their hands to the results of the dice rolls. Each island you advance to gives you a chance at higher point cards, and of course, the designer included special power cards that can be used to bend the rules (like force someone to jump out of the airship or to re-roll favorable dice.) The first captain who collects 50 points in treasure cards is the winner. The game involves so many mechanics that I love. The captains take turns bluffing the players into thinking that they have enough cards in their hand to match the dice rolls, while the players push their luck on whether to drop out (and take the safe points) or push onto the next island. Admittedly, the theme is a little pasted on, but on the other hand, it definitely has much more them than No Thanks! and Can’t Stop, which are all just about the mechanics. At least in Celestia, the airship and the artwork and the island boards all contribute to a vague feeling of adventure and treasure hunting. In the end, the theme is not enough to make or break the game, but it does help it…ahem…rise above the competition. The bits and pieces are perfect for this game. The islands have great artwork, and are sturdy cardboard. There are plenty of islands to make the rounds last just long enough to create juicy tension. The cards themselves are easy to sort and the game is a breeze to set up. The airship even has a rotating propeller on it! The pawns could have been a little more thematic, but I am quibbling here. The rules are fairly easy to understand from the small rulebook. If I had one real criticism, it is in the size of the print of the rule book — by that I mean, the pictures that are contained of the cards. Whether in the spirit of the game, one of the key calculations is to figure out how many good cards are in the stack in front of you. Unfortunately, the pictures of the cards in the rule book are too tiny, so tiny that they are useless in terms of calculation. Until I actually take the time to separate the cards and look at all of them, I will never know how large the point values can get in each treasure pile. Maybe that was intentional on the part of the designer? I have had a lot of success teaching this game to newcomers to our hobby. It takes perhaps one round for even the most inexperienced game night participant to figure out how to play and pick up on some of the bluffing strategies. By round two, even the youngest gamer is picking up on the importance of kicking people out of the airship at just right the time, or bringing down the whole crew crashing if you are the captain and you pushed your luck one island too far. Celestia has been a big hit, and I am not sure why it has not gotten more love and buzz from the community. For my money, it replaces Can’t Stop and maybe even No Thanks! too. So, if your game nights are getting a little bland, and you really want to introduce a fun filler with lots of bluffing and push your luck elements, then get down to your friendly local game store and pick up a copy of Celestia.